We are told that when The Heidi Chronicles premiered in 1988 it was hailed as a pioneering feminist play. Though the play won both the Tony Award and the Pulitzer Prize for Best play of that year, it is hard to see now what made the play so special. It has none of the fire of Githa Sowerby’s Rutherford and Son (1912), none of the outrage of Sophie Treadwell’s Machinal (1928), none of the experimentation of María Irene Fornés’s Fefu and Her Friends (1977) or of all of these together in Caryl Churchill’s Cloud 9 (1979) or Top Girls (1983). Today Wasserstein’s play seems mostly like a mildly humorous time capsule of the period 1965-89 in the lives of women of privilege rather than a bold analysis of the complex choices still facing women in general. Except for prologues set in 1989 that begin each of the two acts, the eleven scenes proceed in chronological order from 1965 to 1989. The two prologues show Heidi Holland (Michelle Monteith), a professor of art history, lecturing about the female painters like Sofonisba Anguissola (c.1532-1625) and Clara Peeters (c.1607-21) that male art historians have omitted from the canon. In Act 1 we next meet Heidi at her high school dance with her best friend Susan (Sarah Wilson), who is anxious to dance with a guy who can twist and smoke at the same time, while Heidi is happy just to read a book. I happens that the articulate, witty Peter (Damien Atkins) from the boy’s school co-hosting the dance notices Heidi and befriends her. The second scene fast-forwards to university where Heidi is campaigning for Eugene McCarthy and meets budding journalist Scoop Rosenbaum (Jordan Pettle), with whom, after a one-night stand, she also becomes friends. The action follows the fortunes of these four characters primarily contrasting the financial and social successes of the venal and ambitious Susan and Scoop with the sadness and doubt of the sensitive and introspective Heidi and Peter. What is most peculiar is that Wasserstein portrays Heidi as an almost entirely passive observer of life. Wasserstein even makes this explicit when she has Heidi identify her role as an art historian as being an “informed observer”. On the one hand, this stance allows Wasserstein to satirize the various situations that confront women. On the other, Heidi is so aloof from everything she observes that we know her the least of all the characters. ce of events in an embarrassing situation at the gym rather than articulate why they were embarrassing. Wasserstein makes Heidi so articulate about what she observes in suppressed female painters that it is hard to understand why she says so little about what she observes in her own life except to state in the vaguest possible way that she is “sad”. Wasserstein’s point is probably to show how a woman of Heidi’s age is caught between the pressure of conforming to women’s traditional roles and the pressure of following feminist ideals. The problem is that Heidi is the only woman Wasserstein depicts who experiences this difficulty. 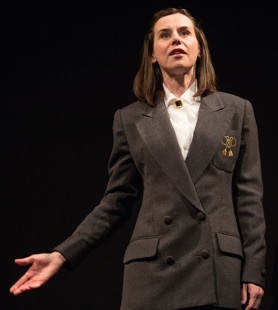 Wasserstein emphasizes Heidi’s passivity and aloofness so much that the play seems to be less about women’s issues that about Heidi’s introverted personality. Heidi opts out of social conventions when she decides to read a book at the prom. It seems less an indictment of society than of Heidi that she should feel left out of life in the second act. Another problem with the play is Wasserstein’s focus solely on privileged white characters. (Black actor Sophia Walker plays white actor Raquel Duffy’s sister, but that and Walker’s other roles were original created by a white actor.) Wasserstein’s habit of name-dropping shows that Heidi and her friends go to Vassar, Harvard and Yale and Heidi later teaches at Columbia so we know that Wasserstein in not interested in depicting the plight of women in need that we see in Machinal or in Top Girls. These women have the money and leisure to be self-absorbed, and for that reason it is very difficult to sympathize with them. In a British play all this mention of top schools, top places to intern, top places to dine, would mark the characters as self-absorbed elitists. In this American play we are somehow meant to be impressed with what the characters have achieved. Wasserstein’s focus on the dilemma of career versus family for the modern woman totally ignores more essential problems women face of simply getting through life unscathed. There is no mention of mental, physical or sexual abuse at the hands of men as if being monied and educated made a women immune from these scourges. That is why The Heidi Chronicles compared to a multi-ethnic, multi-class women’s play like Yaël Farber’s Nirbhaya (2013) looks like a superficial trifle. her scenes with Peter. She shows Heidi’s general ironic detachment everywhere else. Yet, despite a valiant effort, Monteith gives us no clear hold on who this central character is or what motivates her. As Scoop, Jordan Pettle is supposed to be both obnoxious and charismatic at the same time. Pettle manages only the obnoxious part turning that into a general professional sliminess as Scoop grows older, continuing his annoying habit of assigning letter grades to everything as if he had infallible judgement. Yet, with no charisma, it is hard to see why Heidi would even sleep with him let alone maintain a lifelong friendship with him when he represents everything she dislikes. We can better understand Heidi’s friendship with Susan who is ready to try everything that Heidi isn’t. Susan Wilson gives Susan a steady track from dancing with the handsomest boy to taking the most radical feminist path to becoming a general opportunist in love with power and money. In so doing Wilson demonstrates that Susan has been mastering the art of superficiality from when we first meet her. Damien Atkins is the one actor who is able to make his character feel real and fully rounded. Under the playfulness of Peter’s first scene we feel a sense of anxiety that becomes more prominent when he comes out to Heidi as gay and later in the hospital scene of Act 2, the best scene in the play, when Atkins reveals that Peter’s aberrant behaviour is a product of fear and grief. 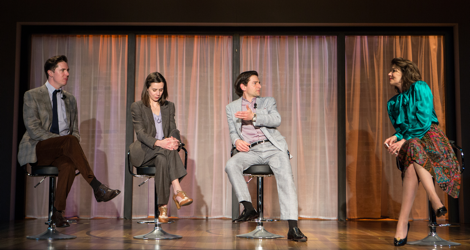 The other four actors play multiple roles and it does happen in Wasserstein’s script and in Gregory Prest’s direction that it is not always clear when they have changed personas. Laura Condlln’s two best roles are as a grungy lesbian stereotype with anger management issues and as a self-satisfied television talk show host. Raquel Duffy is best as Lisa, the Jewish Southern belle that Scoop marries because she wants to be a stay-at-home wife. Sophia Walker’s best role is that of Becky, a shy woman who gets up the courage to speak out at the women’s group. Paolo Santalucia is saddled with five tiny roles, the best of which is probably the indignant waiter who serves Susan and Heidi in a swank restaurant. Gregory Prest in his first directing assignment for Soulpepper is is efficient and unfussy. In most scenes the reasons for the characters’ reactions are clear but in one crucial scene they are not. This is the scene when Peter tells Heidi he is gay. Michelle Monteith has such an outsized reaction to the news that our first impression is that she is homophobic. We are likely supposed to think that Heidi its shocked to find that any romantic illusions she harboured for Peter are shattered, but that is not how the scene plays out. It takes the rest of the play until the hospital scene of Act 2 before a residual impression of Heidi’s intolerance is erased. The main value of The Heidi Chronicles now is as a kind of nostalgia trip reinforced with songs of the 1960s, ‘70s and 80s all well chosen. The play’s happy ending with the foundation of a new kind of family unit seems overly optimistic. The doubt and fear in the endings of Churchill’s Cloud 9 and Top Girls today seem far more prescient since, as we know, advances in women’s rights do not always lead to a greater appreciation of women as equal human beings in society in general. 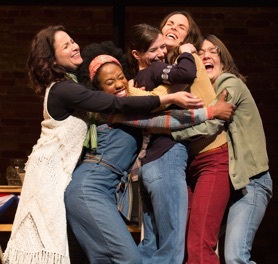 Let’s hope that in future the dramaturge at Soulpepper selects plays based on their intrinsic worth and complexity rather than whether they have previously won awards. Photo: (from top) Damien Atkins, Michelle Monteith, Jordan Pettle and Laura Condlln; Raquel Duffy, Sophia Walker, Michelle Monteith, Sarah Wilson and Laura Condlln; Michelle Monteith. ©2016 Cylla von Tiedemann.